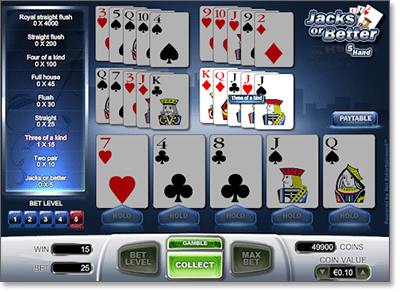 Jacks or Better is the most popular variety of online video poker. While there are many different payout scales that can be applied to this format, in every case the lowest paying hand is a pair of Jacks – hence, we must get ‘Jacks or better’ to win. Here, we will discuss basic strategy, house edge, and where Australians can play real money video poker via the Web. All of our trusted Internet casinos carry interactive versions of Jacks or Better, along with dozens more virtual video poker titles. Our number one website for Australians is Royal Vegas Casino, which boasts over 500 Microgaming releases along with the eCOGRA Seal of Approval for safe, secure AUD gaming online. Jacks or Better is essentially a single-player version of five-card draw poker. Players bet between one and five coins per hand, with a different set of payouts for each wager size. Five cards are dealt, and we can choose to keep (hold) any amount of those five and trade in the remainder for new cards (draw). If we end up with at least a pair of Jacks, we win; if anything less, we lose. The stronger the hand type, the bigger the reward – for example, a full house pays more than a straight. Aside from single pairs, where we must get Jacks or higher, numerical values have no effect on the payouts – for example, a three of a kind in Fours pays the same as a three of a kind in Kings. In many versions, we can opt to double up when we hit a winning hand – much like the ‘gamble’ feature found on many pokie machines. This mini-game often shows us a face-down deck and asks us to wager our win on the colour or suit of the top card. If we guess correctly, we can either collect our winnings or double up again; if we guess wrongly, we lose the whole lot. Another incarnation shows us a face-up card and asks us to choose one of four face-down cards, where the higher-ranked card wins the bet. 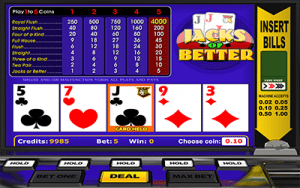 Jacks or Better can come with any number of payout scenarios, although these discrepancies are generally limited to land-based video poker machines. Online versions stick almost exclusively to the ‘full pay’ format – also called ‘9/6’, because the return on a single-coin bet is nine coins for a full house and six coins for a flush. Below is a list of payoffs for all winning hands in Jacks or Better at Royal Vegas Casino, based on the number of credits wagered per hand. Note what happens when we bet five coins per hand. In all other instances, every return can be summed up as: base payoff x coins wagered = return. For example, if we bet three coins and hit a straight (which pays 4 for 1), we collect 12 coins. However, when we play the maximum bet we earn a significant bonus on the royal flush, which pays 4,000 when it ought to return only 1,250 coins. This lowers the house edge by about 1.1 per cent, and so most video poker gurus recommend always playing five coins per hand. One of the benefits of playing video poker instead of slot machines is that we can increase our chances of success by using specific methods of play. In Jacks or Better poker, applying the following strategy developed by Michael Shackleford (a.k.a. the Wizard of Odds) can bring the house edge down to as little as 0.54 per cent. As mentioned earlier, we recommend playing five coins per turn to maximise your potential returns. When we are dealt our initial hand in Jacks or Better, at least one of the above combinations will be in play. To decide which cards to hold and which to fold, we must determine all the possible plays and choose the highest ranked option. For example, say we are dealt the following hand: 10 of Hearts, 10 of Clubs, Jack of Hearts, Queen of Hearts, Queen of Spades. Here, we have two pairs (Queens and 10s) as well as three cards to a royal flush (10, Jack and Queen, all Hearts). According to the rankings above, the best strategy would be to hold the Queens and 10s rather than play for the royal flush. Experts are divided regarding whether or not to double up on a winning hand. We feel it comes down to a matter of preference, based on one’s overall gambling philosophy. If you like to grind it out and keep potential deficits to a minimum, then don’t take the gambit; but if you are happy to risk some capital in search of bigger profits in shorter sessions, then doubling up is the way to go. This wager normally pays true odds (i.e. the return matches the probability of success) and thus carries no house edge. There are two standout versions of real money Jacks or Better for Australians on the Web: one developed by Microgaming, the other created by Net Entertainment. The Microgaming Jacks or Better game is among the most widely played online video poker titles in the world, and is featured at Royal Vegas Casino – our top-rated AUD gambling site – as well as All Slots. It follows the 9/6 full pay scale, so Aussie poker players get real value for money. The NetEnt option is available via instant play directly over your Web browser at House of Jack Casino. Aside from a very clean, 21st-century visual layout, it comes with a very nifty multi-deck feature that allows us to play up to 100 hands at once – and while that means putting up a lot more cash when playing five coins per hand, it also results in enormous payouts when we draw a beauty off the bat. Whichever version you prefer, playing Jacks or Better online opens up a host of benefits not available at brick-and-mortar casinos. For one, you don’t have to journey into town and squander your hard-earned bankroll on extortionate cab fares, public transport, or petrol and parking. For another, there’s no hovering around awkwardly waiting for your favourite machine to free up. But what we love most is that we Aussies can enjoy real cash video poker at our own pace, in our own homes, and can use whatever strategy guides and tutorial aides we like without security staff and casino managers breathing down our necks. Simply put, it is an easier, funner way to play. Sign up to play real money video poker at Royal Vegas Casino and get up to AUD $1,200 in free bonus credits.